You’ve seen them in psychic store windows, displayed in circles at meditation classes and maybe just thought the array of crystals were solely for fun. Well think again because crystals of all shapes and sizes can channel your inner chi, reset your chakras and are known for healing physical ailments. If this opener’s got you interested, then you need to reserve your free entry at the Sydney Crystal Show, 8-9th July. If you’re not in NSW during that time, then make a note that the show will return early December. As one of the country’s most prominent and popular mineral expos in Australia, you’ll be able to browse from thousands of gems including jewellery, fossils and wow at the extensive range. Having good energy around your home, in your handbag, work briefcase and pretty much every corner you’re near is important. The crystals have mysterious ways of zapping out bad energy, stopping extreme emotions from bubbling over and absorbing this into creating a positive aura around you. We all know positive energies spread like wildfire. Each crystal has a meaning and a method behind its madness. From agate that brings strength and courage, to aquaramarine for clarity and purification, clear calcite to cleanse and citrine for revitalization. And we’re not even a quarter of the way through the alphabet. Check out Crystal Earth Spirit for an extensive list of who’s who in the mineral world, and what each can do for you. That’ll give you a decent head’s up on narrowing down the negative energies you need to get rid of in life, and bring in the good, ripe ones to take you through the next stage of your life journey. Some of the crystals featured at the expo will run into a few thousands dollars where others, the rose stones or miniature sphere’s that fit into your palm, come cheap at around $10. Not only are these crystals stunning for display pieces but you’re investing in your well being. So when you visit Sydney, spread the good energy around and treat yourself to a small stone that’ll fit into your pocket. The more you squeeze it to release negativity, the healthier you’ll feel and the more you’ll enjoy our fantastic city. Once you’d done with the expo, head back to Cremorne Point. Take a walk near our hotel and breathe in those inner white lights, while you experience the stunning Harbour views & skyline. If that doesn’t get your Anahata (heart chakra) pumping, not much else will! Alzheimer’s Australia is hosting their annual Memory Walk Sydney on the 7th May, starting at Leichardt Oval. You can sign up for the 2 km or 7.5 km walk (or even run) to raise funds and more awareness for the race against dementia. All the proceeds will be given to related education, professional training, critical support services and counseling for people (and families) affected by this illness. If you register early, you may still have a chance of receiving a complimentary Memory Walk & Jog t-shirt. But with only 500 available, there’s a slim chance any are still up for grabs. It does cost you to be part of this event but kids (under 5 years old) can enter for free. Kids 6-17 years old and seniors cost $19, adults are $36 and families (two parental supervisors or two seniors with two rugrats) is $85. If you’re ready for a morning start, the Memory Walk & Jog will beat you to the punch as registration opens 7.00 am, astonishingly early for a Sunday! This’ll give you around an hour to warm up those legs (and brain) for the 8.45 am runners start, followed five minutes later by the walkers for your marks, get set and go, go, go. With the prizes given out at 10.30 am and the race officially finishing thirty minutes later, it’ll be an incredibly productive Sunday morning for all involved. Even though you’ve paid an entry fee, if you really want to take the illness bull-by-the-horns, you can set up a fundraiser. Make sure you sponsor yourself first, to entice others to follow and then its case of rallying for serious hard currency from friends & family. Fundraise the standard way through social media or step it up a notch with a friends & family afternoon or evening cash soiree. Possibly you could set up a theme activity such as ‘memory lane:’ each person is given a clue about a long-time-ago personal event that took place. If they remember the event from the clues, then they add $20 to the fundraising pot. Not only will the moolah flow in faster than you’d expect, but it’d remind everyone of how much we do take our brains for granted. Imagine having dementia and all those precious memories just fade away? Right – that hit the emotional core so sign up for the event and start fundraising pronto. And maybe you’ll also remember to swing by our hotel in Cremorne Point to let us know how your walk or jog went. 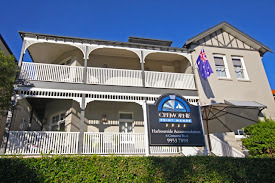 A double reminder: possibly treat yourself to a night’s stay (or weekend) at Cremorne Point Manor after the fundraiser. The views of the Harbour and downtown skyline are stunning…something you’ll remember for a long time to come. Morale: Don’t take your brain in vain. It’s that time of the year when you need to focus on out with the old, and in with the new, right? Undertaking a mass clean out isn’t the most riveting task but the team at Suitcase Rummage have turned boring hoarding into purge & splurge with a twist. Over cups of tea, the founders (Isabel and Daniele) pretty much landed on the idea during a brainstorming session. To them, Suitcase Rummage wasn’t about being a typical weekend market with power-sellers but more about where product entrepreneurs could also test their new ideas on the public to assess for market viability. Naturally, alongside bringing the community together and Joe Public selling or swapping their wares. What better way to run a focus group than on a captured, ready to prowl audience right on your doorstep! All you need to do is bravely venture into the back of that closet under the stairs, grab all the clothes, books, collectibles and every possession that you’ve not even blinked an eye at for years…and jam them into suitcases. Product entrepreneurs, you’re doing the exact same with your inventions - lovingly & carefully swaddled in each suitcase. Once you’ve registered and paid the $25 fee to offload your old belongings, head down to the Suitcase Rummage market (you’ll be notified of the upcoming event in your area). At the Rummage, expect be greeted by imaginary angels singing over your head as you open your pot of gold suitcase latches, and start selling or swapping items with other Rummagers. When you mosey over to the Rummage event with your suitcase in tow, full to the brim of jewellery, shoes, accessories and heaven knows what else…don’t be surprised to see an up and comer also selling their new innovation goods right besides you. The rummages are regularly taking place at select locations in Queensland, NSW, Canberra, Victoria and Western Australia so yes, this is not just a tiny local event. It’s becoming a suitcase movement. The Sydney events are at Belmont Park (opposite Central Station) every second month and the next will be around the 3rd week of June. This will give you plenty of time to start accumulating those items to sell. It’ll also be a double bargain for visitors staying in our hotel in Cremorne Point because here’s a new travel idea: whatever is in your suitcase when you arrive at our hotel, take it to the Suitcase Rummage, sell or swap it and return back to our hotel with potentially a completely different, full range of clothes, footwear and accessories! You came, you saw, you sold, you swapped and you conquered. This coming Sunday 26th March, the International Convention Center at Darling Harbour, wants you to return home. Yep, the Sydney Home Show is hitting NSW and it’s free to attend. Not one cent is required to enter the gates of domestic heaven. You do need to register for free tickets though. You’ll get to chat with over 280 major exhibiting companies alongside industry hot-bods. As one of the city’s most popular home renovation events, there will be over 30,000 homeowners who are knee deep in looking to renovate their haven. There will be Holy Grail experts giving you tips on outdoor living spaces, décor, furnishings you’d never dreamed of, renovation ideas for the interior and exterior and accessory ideas coming out your ears. The latest and greats accents, décor and snazzy furnishings will be on show and ergonomically friendly, state of the art and minimalistic ideas are looking to be the key themes this year. You think you know all about decking and patios? Then think again. Make a note to check Nexgen Decking at Stand G32 if you’re looking to spruce up the BBQ area. Tired of maintaining your bathrooms? Put Nano4Life Australia at Stand A17 on your ‘must see’ list. They have incredible ceramics that retain that brand new ‘just installed’ look. No more soap stains in your bathroom. One company we’re seriously infatuated with is Aurora suspended fireplaces. Mosey on down to Stand G47. Your own fireplaces will look SO 1980’s compared to these stunning suspension alternatives. The Home Show website has a bundle of interesting tips for you DIY’ers. From programming your garage door remote to solar home options, artificial turf versus grass possibilities and a long list of tips on how to spruce up your nest. Remember to scan your ticket at stands throughout the show so you can enter to win some incredible prizes. The list is growing but currently up for grabs is a top-range front load washer, Oslo rug and $1000 by Kleenmaid. Want to try another home away from home? 10 minutes on a ferry ride from the Harbour to Cremorne Point, you’ll be at our Manor. When you’re a guest of Cremorne Point Manor, our balcony is your balcony, our stunning view of the Opera House is your view also and our breakfast… Well, not quite. But when you book direct on our website, a sensational breakfast is included. Not sure if you believe us? Then believe this video tour of our hotel – it’s magnificent. We all know St. Patrick’s Day is the time when the planet turns green, drinks Guinness and gallops around in three legged races looking for four leaf clovers. But this blog post is about the history and quirky traditions the luck of the Irish has given us, in abundance. Why does this famous day exist? It’s a worldwide celebration of St Patrick, one of the country’s patron saints. He ministered Christianity during the fifth century, within Ireland. This tradition of celebration (originally with a Roman Catholic feast day – now celebrated by liquid lunches and dinners) started on March 17th, the year 461. Why is everyone green on St Paddy’s Day? It’s simply as a camouflage disguise to ensure leprechauns (tiny fairy creatures) don’t pinch you. So if you don’t wear green on the 17th March, anyone has the ultimate right (or non right) to pinch you, with themselves taking the responsibility of acting on behalf of these fairies role. Also remember, pinching hurts and causes bruises so maybe just pretend pinch the air instead. Our words of warning to all trigger happy pinchers reading this! What on earth do leprechauns look like? Even though we call them fairies, they’re actually an Irish folklore, described as little bearded men, with hats and coats that are incredibly mischievous. They love living in solitary, counting and guarding hidden pots of gold at the end of rainbows. They’re also renowned for mending shoes. Maybe they inspired Daniel Day Lewis to take up cobbling between acting, way back when. How green is Ireland? The country was originally associated as blue yet over the centuries, it morphed into green. Hence the country’s nickname ‘Emerald Isle,’ the green Irish flag and the four leaf lucky clovers that St. Patrick expressed through his teachings about the Catholic religion. So this March 17th, when you’re out and about with friends & family, enjoying all the amazing wonders of Ireland and the great St. Patrick, remember: no pinching, wear green, maybe consider cobbling as a new career and hunt for that gold at the end of the rainbow. Once you’ve had your Guinness dinner (a meal in itself, full of incredible nutrients), hop on a ferry and within 10 minutes from the Opera House, you’ll be back at Cremorne Point. Aptly, our Cremorne Point Manor is in a stunning, residential setting and full of greenery. With our affordable rates, greatly lower than downtown hotel prices, you’ll now see why our guests know the grass is greener in our neck of the city. From now until 17th April, The Calyx at the Royal Botanical Garden is featuring the Sweet Addiction tour. A brand new exhibition to open at The Calyx, it’s an incredible horticultural attraction not to be missed. Venturing into the story of chocolate, you’ll learn more information about your sweet tooth, and the origins of chocolate like never before. Starting at the center of the tropical rain-forest, you’ll walk through chocolate plantains, a Lindt Mill and discover the ancient history behind its roots and why chocolate is such a global, constant booming business. The largest contiguous green wall in the southern hemisphere features over 18,000 plants, stunningly presented into living artworks. These represent the Mayan God of Chocolate. A fantastic expo for all ages, it’s an event that’s causing a fantastic rush of cocoa lovers. Sweet Addiction is a half hour self-guided tour so take your time and stop to smell the non-roses. There’s also an audio tour including a kid friendly audio (5-12 years old). And with the Botanical Garden’s interactive chocolate-theme events and attractions, The Calyx is the first of its kind in Australia. This is a continuation of the Garden’s 200th birthday in 2016. Prices for adults are $15, kids under 16 years old enter for free and seniors/concessions are $9.50. The Calyx is beyond stunning. You can see if there are cocktail events taking place during your visit or check out the schedule for hosted seminars and dinners. International award winning designer and horticulturist, Jamie Durie is the man behind The Calyx. On the website you can download his garden trail, or check out Catriona Rowntree’s garden map. As the country’s ‘most travelled woman,’ she’s now ambassador to The Calyx. As The Calyx is a short ferry ride to Cremorne Point, there’s no better way than to spend an afternoon or full day at the Gardens, mosey around downtown Sydney and then head back to our neck of the woods. Talking of chocolate, when you stay with us, expect a special treat from us on your bed pillow. It’s called Chocumin and each piece contains equivalent to 60 turmeric herbal pills. So if you’re weary after a long day out and feel those knee & ankle joints start to swell, we have you covered as turmeric contains incredible (proven) anti-inflammatory remedies. What a sugary way to experience Sydney…then Chocumin yourself just before bed and enjoy sweet dreams.